McDole then slumps left, rolls out of his chair and falls to the ground, with blood visible on the front of his body. Police have released few details, but they said McDole had a handgun when officers allegedly shot him to death. At a press conference held at the scene of the shooting on Thursday, a crowd of two dozen people gathered to protest the incident. McDole’s uncle, Eugene Smith, was among them. “It was an execution. That’s what it was. I don’t care if he was black, white, whatever,” Smith said, as reported by CBS News. Smith said he saw his nephew 15 minutes before the shooting and that McDole had not had a gun – only a book bag. Smith said McDole had gotten out of a jail about a year ago and was living in a nursing home near the scene of the shooting. 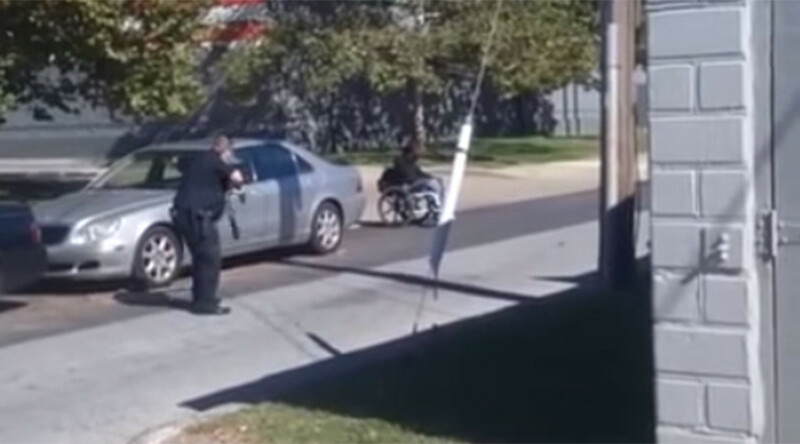 McDole had been in a wheelchair since being shot in the back when he was 18. The Delaware Department of Justice’s Office of Civil Rights and Public Trust is investigating the shooting and will determine whether the officers acted within the law. The agency investigates all police shootings that result in injury or death.